The language barrier and authenticity at Pili's creates a de facto adventure with every meal. After a brief conversation / round of charades with the lovely chef / owner at Pili's about what exactly buche is, I ordered a taco. I wrongfully concluded it was the chin of a pig. It's not. According to many internet sources, buche is pork stomach cooked in lard. Update: according to an email correction, buche is a pig's esophagus. 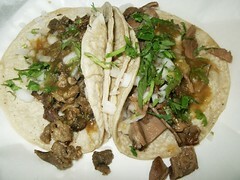 Picture: al pastor on the left, buche on the right. You can see how the al pastor is a little more chunky, and the buche is flaky. As far as food that qualifies as daring for gringos like me, pig stomach was pretty easy to take. Like everything else at Pili’s I thought it was great. See also: goat stew, chicken piping, and cow cheek. This Pili's Tacos meal was rated: 6.8. Saturday, April 29, 2006 by Jonah.